Savor the views of the green fairways from every window on the East side of this 3,113sf, 4 bedroom plus den & loft, 3 bathroom Pulte home with pool & spa. Situated on a premium golf course lot, this two-story Senita floorplan features a resort style backyard with loft viewing deck for stunning sunset views of the San Tan Mountains. Through the inviting entry you'll find dramatic vaulted ceilings & a front den with double door entry, wood flooring & a peek into the community park. Filled with natural light, the large formal living & dining areas lead into the eat-in kitchen with center island, Corian counters, cherry cabinets & walk-in pantry opening up to the open family room with vaulted ceilings, gas fireplace & golf course views. The master suite is conveniently located on the main... level with a full guest bath and laundry room and features large bay windows, custom draperies, a separate patio exit & a full ensuite bath with new lighting, dual vanities, shower, jacuzzi tub & large walk-in closet. Your guests will enjoy the generous size upstairs guest bedrooms and large loft with access to the balcony for a private staycation. Relax together outside in your private pool & spa surrounded by professional landscape design & hardscaping. 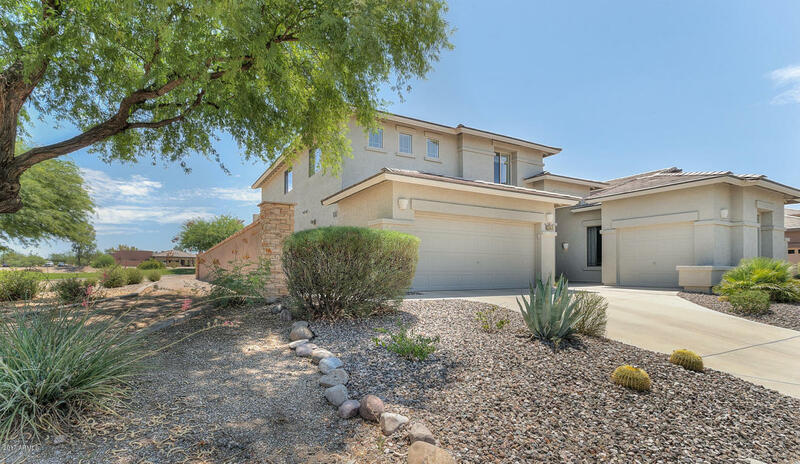 Situated on the best view lot of the Lone Tree Golf course and in the highly sought after Springfield Lakes community in Chandler, this home is close to shopping, fine dining & major employers including Intel, Wells Fargo and the Price Corridor.